China has been influenced by Confucianism for a long time while Pakistan is a country with a firm belief in Islam, which gains the two countries distinctive cultural features. Confucianism doesn’t belong to the religion. However, it has developed and ruled people’s mind as an official thought for more than two thousand years in China, which gains Confucianism a religious-equal status. In this respect, Confucianism goes beyond religion. It imposes subtle impacts on Chinese people’s mind even without their awareness. Pakistan is a Muslim country with about 97 percent of people believing in Islam. As a result, Islam is the national religion and exerts great influence on all aspects of life. People can feel a strong religious atmosphere in Pakistan. A large part of social activities, traditions, customs are centered on it and the religion further affects the values, culture, and ways of thinking and behavior of people in Pakistan. Therefore, Pakistan, a religious country, presents a totally different society compared with China. Cultural differences mainly manifest in the religious area, customs area and the ideological area in which communication, food habits, festival and others, social view, gender view, marriage view, and time view play important roles. Gender view is also an important dimension which reveals cultural differences. In China, gender equality is what the whole society pursues. Women play an important role as men in all walks of life and receive the same popularity in the workplace. But in Pakistan, gender discrimination is so common and normal that almost everyone takes it for granted. “Culturally, women are seen as inferior to men and are expected to be obedient to their husbands and other male members of the family.” From this, the gender discrimination goes without saying. Greatly influenced by the religion, Pakistan is a much more conservative country. A relationship between a boy and a girl not aiming at marriage is not allowed. Thus, dating is not common. Before the marriage prospects, the relationship is kept secret and young people are restrained to show love in the public. Most Pakistani girls are traditional and want to get married. A large portion of marriages is arranged by parents. The marriage view of Pakistani people is generally based on traditional culture and in accordance with religious demands. Chinese people keep a relatively open mind to the marriage and their understanding of marriage has a modern approach, which increases the freedom and flexibility of the marriage. In a complex Pakistani society, a new phenomenon is in vogue ‘CPEC marriages’. People say privacy is a common phenomenon that exists in every culture but is just interpreted and expressed differently. Yeah, right! Go tell any Chinese and see their reactions. Chinese are bent on dismissing privacy as a bad thing, and their zeal might have something to do with its negative connotation. In Chinese, “si yen” means seclusion and implies secrecy. Chinese have little comprehension of personal boundaries or personal space. On the other hand, the Constitution of the Islamic Republic of Pakistan enshrines the right to privacy as a fundamental right. Article 14(1) of the Constitution confirms that “[t]he dignity of man and, subject to law, the privacy of a home, shall be inviolable.” As a fundamental constitutional right, the right to privacy is meant to take precedence over any other inconsistent provisions of domestic law. Are Pakistanis going the Chinese way? However, it is now seen that surveillance across all of Pakistan’s communications networks is becoming more widespread. Intermittent but devastating attacks within Pakistan’s major cities by armed groups, such as the 2014 Peshawar school attack by a Taliban-affiliated group, have been cited as a reason to expand surveillance in Pakistan. Interception across Pakistani networks is therefore pervasive; some of it is also unlawful. A Supreme Court hearing about a case concerning phone tapping revealed that the ISI intelligence agency had tapped 6,523 phones in February, 6,819 in March and 6,742 in April 2015. The impact of surveillance in Pakistan by both the State and other actors has become increasingly reported on and documented by civil society groups, with some research conducted with particular groups in society such as female journalists and women. Taking the history and current situation into consideration, people in Pakistan have been experiencing great changes of regime, culture, and religion that they are adaptable and tolerant. According to the creeds in the Quran, everything in life is arranged by God and Pakistanis believe in fate. So it is nobody that should be to blame for or take responsibilities for failures which are considered as acts of God. If a calamity or tragedy, unfortunately, occurs to someone, others will comfort each other with the word kismet. In China, although humility and mildness are national ethos, introspection and self-criticism are absolutely necessary after a failure and the person who is supposed to be in charge will be investigated and hold responsibility. While Chinese are detaining and imprisoning millions of Uyghur Muslims in disguised concentration camps, the Chinese version of the infamous Russian gulags, Pakistani premier Imran Khan claims to be completely oblivious of the ongoing ethnic cleansing of Uyghur Muslims in China. Why is he tight-lipped? Is Pakistan already a slave of China? 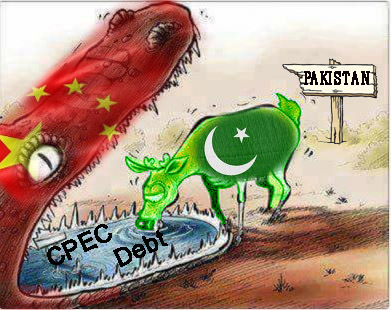 The Chinese economic and strategic promise is extravagant and almost blinding for Pakistan. However, it has unleashed a new cultural wave posing serious challenges to the already ethnically vulnerable Pakistani society. Presently, Pakistanis seem to be enamored by a foreign bait, happily embracing China’s moral void.